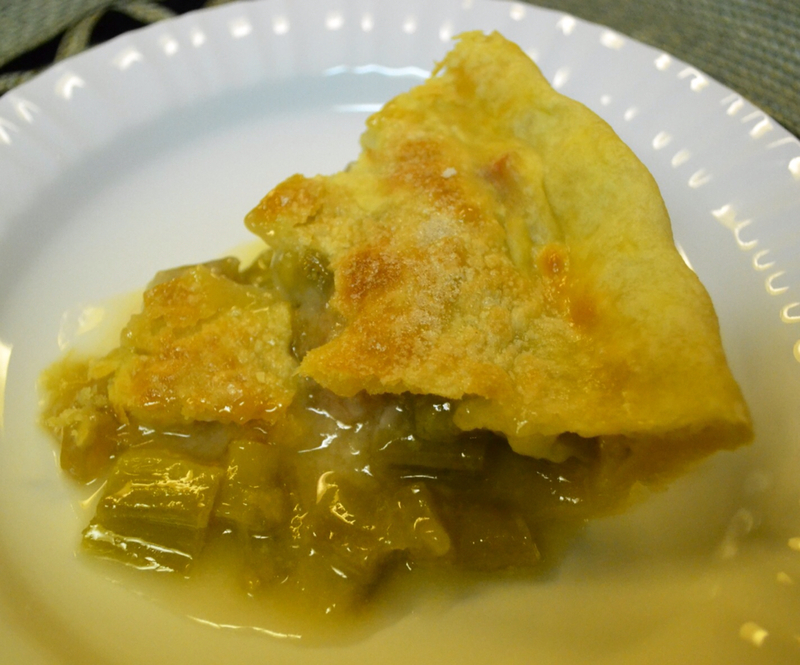 Over at Julie's: Fresh Rhubarb Pie . . . Oh Yah, Baby!!! What could be more perfect than combining my 2 favorite foods? 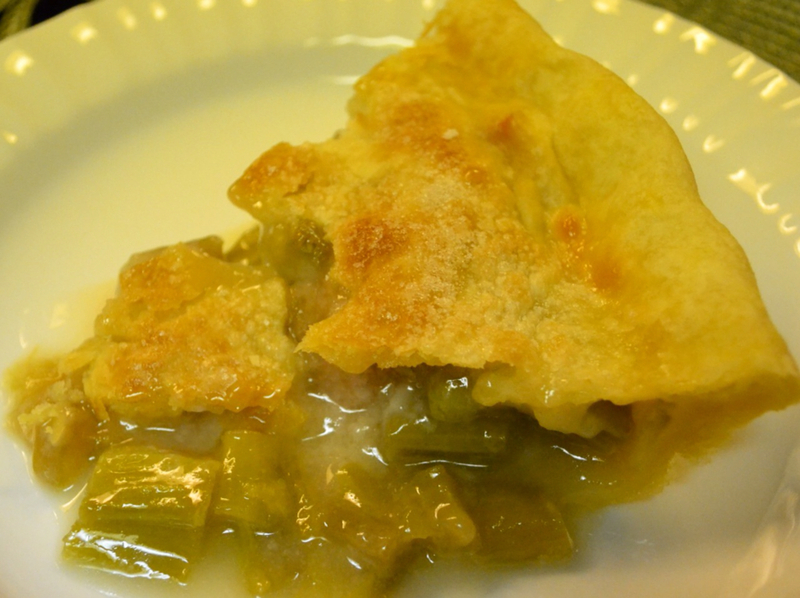 I love pie and I am head-over-heels "In Love" with anything that features RHUBARB as the main ingredient! Being a transplant from Michigan, and now an "Arizona" girl, my own rhubarb patch is a very precious commodity! I have neighbors drooling over it! I have a Mother-in-Law (originally from the Midwest) asking (actually begging) for a bit to make a strawberry-rhubarb pie! And, all 3 of my grown sons love to eat tart, crunchy rhubarb straight from the patch, with a handful of salt for dipping! I'm a Purist when it comes to rhubarb and pie! I want to taste rhubarb in my pie, not muddle it up with strawberries! Strawberries have their place in homemade ice cream, shortcake and in fresh strawberry pie, but not cooked beyond recognition, in a strawberry rhubarb pie! Our 1st Daughter, Annie is doing a retreat up in Prescott this weekend, so our eldest son, Jason and the girls are coming here for supper tonight! Jas, is bringing ribeye steaks for the grill. I'm making homemade French bread, asparagus, baked potato, carrot sticks and radishes pulled fresh this morning, from our garden! And for dessert . 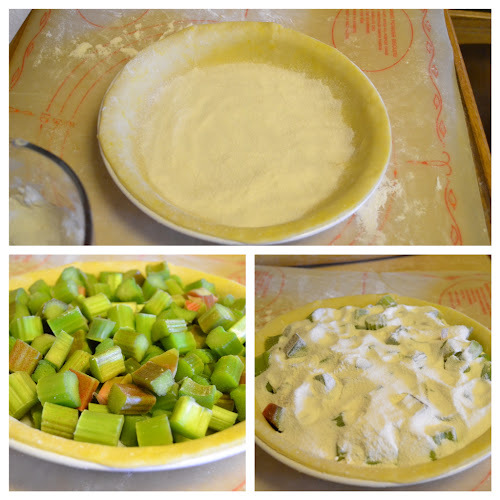 . . Fresh Rhubarb Pie! Ahhhh! I can't wait! 2 drops of red food coloring, if your rhubarb isn't rosy colored. 1 tablespoon of pure cane sugar, for sprinkling on top of pie crust. Combine sugar, flour and food coloring with a whisk to distribute the coloring evenly. Sprinkle 1/4 of sugar mixture over the bottom crust in the pie pan. Heap rhubarb into pie pan on top of sprinkled sugar mixture. 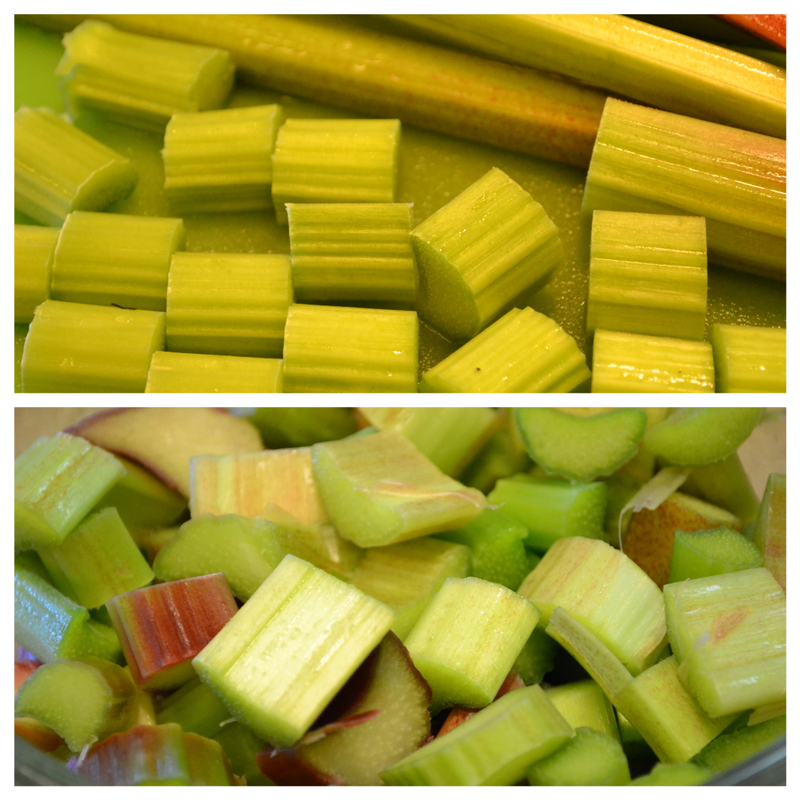 Pour remaining sugar mixture over rhubarb, give a little shake to fill all the crevices. Brush crust with whole milk or half and half and sprinkle with sugar. 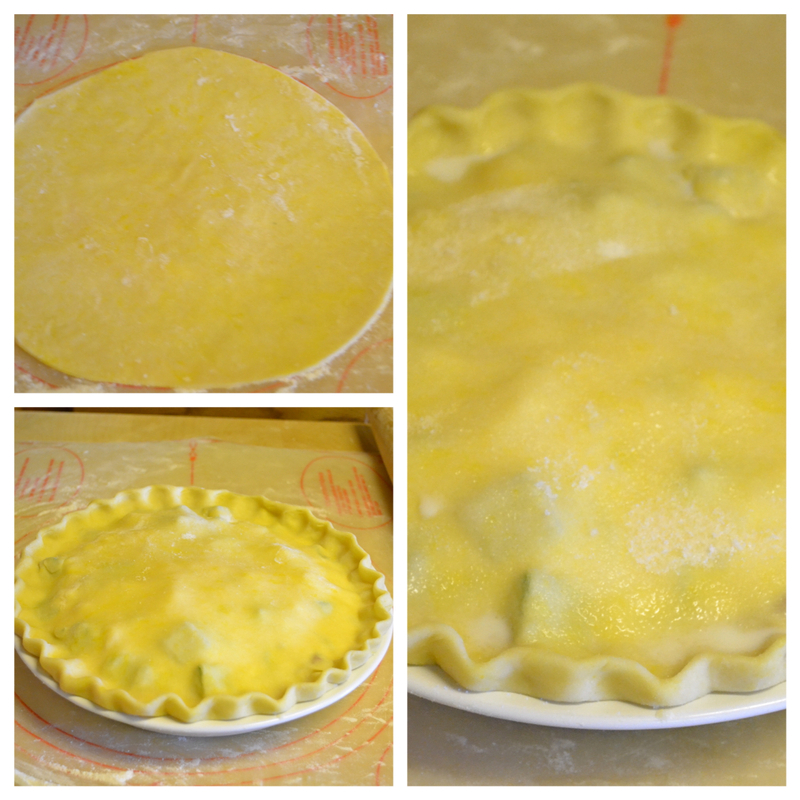 Cover edges of crust with a strip of aluminum foil, about 2 1/2-inches wide to prevent over-browning. 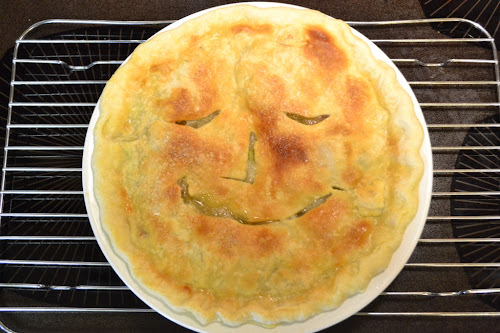 Cut a smiley face : ^ ) into the top crust to vent, or make small slits with a sharp knife. Reduce oven temperature to 350F. (175C. ), and continue baking for 40 to 45 minutes more. I apologize for the rather plain looking green pie, I was multitasking and forgot to add a tiny, wee bit of red food coloring. My Victoria rhubarb isn't very red and needed a little help "from a bottle". Rhubarb chopped in pieces and measured in a glass measuring bowl. rhubarb heaped in ~ Remaining sugar mixture poured onto rhubarb ~ Dotted with butter. Crusts fluted to seal top and bottom crusts together ~ Brushed with whole milk and sprinkled with sugar. 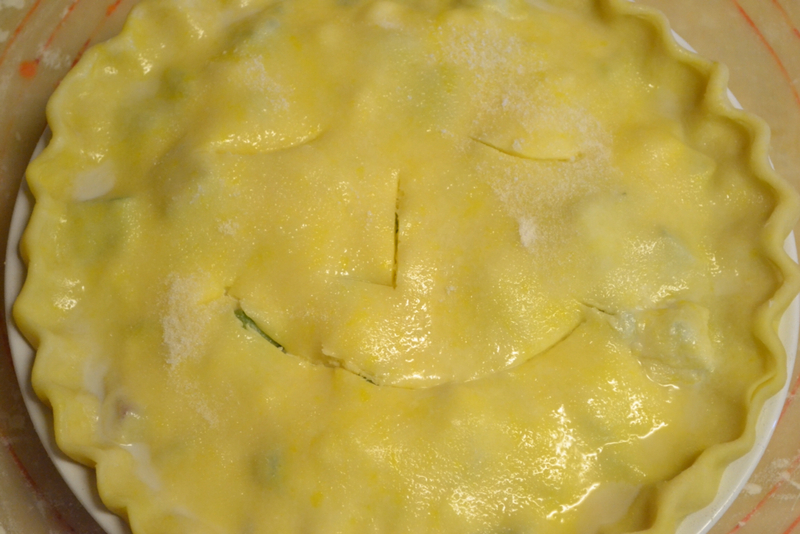 Smiley face cut into crust! 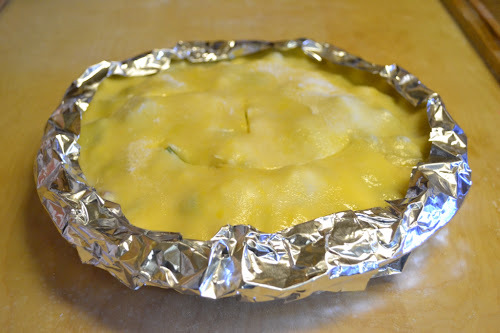 Adding a foil collar to keep edges of crust from over-browning. Hot out of the oven . . . Lookin' and smellin' mighty fine! This rhubarb pie is tart and sweet . . . the crust baked to flaky, buttery, perfection! We had a wonderful evening together! The steak melted in our mouths like butter, the French bread was served hot from the oven, (crunchy on the outside, soft and tender on the inside) but the girls were very careful to save room for RHUBARB PIE! I never thought I'd have enough rhubarb to bake a pie! 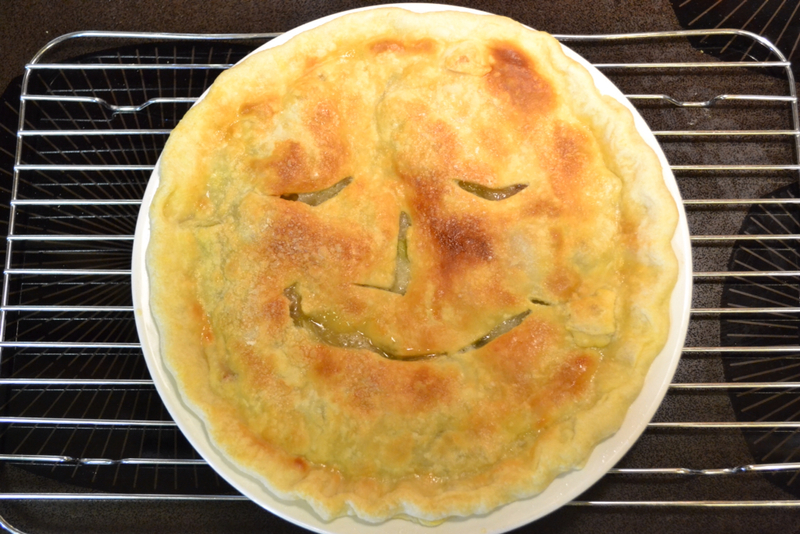 In fact, this is my very first homemade rhubarb pie EVER baked in my kitchen, in our 32 years of living in Arizona! Definitely a milestone! This Fresh Rhubarb Pie exceeded our wildest expectations . . . Over at Julie's!! !